According to today’s Daily Mail I should be damned. I am a father, a husband. A fan of a League One local football team. I spend my working life fighting for the rights of people against large corporations. I like to think that I am tolerant of other people and that I am a fundamentally kind person. I don’t believe that I have many enemies. I spend too much time in the pub, talking politics and I am probably open to the accusation that I can condescend. There are a handful of people I fell out with over the referendum. A similar editorial to that of the Daily Mail also appears in today’s Daily Express. These newspapers, in effect, call for people like me to be silent, or silenced. By which means are they going to achieve that? By encouraging the breaking of my windows for being “unpatriotic”? By having laws passed to prevent my internet access? By inciting the smashing of my PC and laptop in a public spectacle? On the 9th November 1938 Jews throughout Germany were subjected to the terror of Kristallnacht. That night their windows were collectively smashed. At the time the Daily Express was openly opposed to the arrival of Jewish refugees to the UK from Nazi Germany. Five years or so before Kristallnacht the Daily Mail published an article in which its owner opined that the “minor misdeeds of individual Nazis” would be “submerged by the immense benefits (of National Socialism)”. In the same year the Daily Express printed a headline “Judea declares war on Germany” in response to an international attempt to punish the emerging Nazi regime by boycotting German imports. In January 1934 a piece appeared in the Daily Mail in support of Mosley’s fascists, titled “Hurrah for the Blackshirts”. Viscount Rothermere praised their “sound, commonsense, Conservative doctrine”. As the 1930’s progressed, The Daily Express continued to support the appeasement of Hitler by Chamberlain. The Spectator said of the Daily Mail in the years of the dark corridor that led to the Second World War that its “appeal” was to “people unaccustomed to thinking”. Times have not changed, it seems. 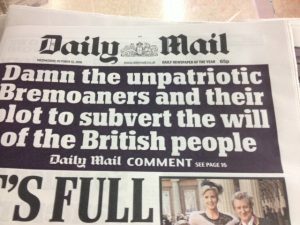 I will not take lessons on patriotism from the Daily Mail, neither the Daily Express. Nor will I be convinced or swayed by their stated utopian visions of the future following the implementation of the “B” word, whatever that may mean. Their respective track records at setting out visions for the future are less than impressive. “…it is unpatriotic not to tell the truth”. So, it is off to Newcastle on Saturday I go to March for Europe, thanks to the Daily Mail and the Daily Express. Is this the start of the implosion of British politics? Miliband and Starmer pulling one way. Corbyn and Abbott the other. The latter, of course, will support each other come hell or high water. The Parliamentary Labour Party is all over the place and clearly Jeremy Corbyn has little genuine support from the majority of his MP’s – after all, he could hardly make a quorate shadow cabinet not so long ago. In the meantime Theresa May’s Birmingham Conference could not have gone worse for the tories. Her lurch to the right has caused many of them (including leavers) to be very anxious indeed. Amber Rudd’s speech so well shamed by James O’Brien on LBC as bearing certain similarities to passages from Mein Kampf was a major own goal. This should cement the will of Ken Clarke, Anna Soubry et al. to engage with the Liberal Democrats who are now stirring; Nick Clegg has upped his game and Tim Farron represents an uncontentious and untainted pair of hands in these times of madness. A good turnout please, people of Witney, Oxfordshire for Liz Leffman. In the meantime Dr Fox couldn’t have excelled himself better at alienating an increasingly frustrated and incredulous business community. The economic reality is beginning to become evident courtesy of sterling’s nosedive to become, save for the Argentine peso, the worst performing currency of 2016*. This is something that any man or woman on the Clapham Omnibus can understand. Simple. The rest of the world has no confidence in the UK economy. The nosedive didn’t end with the announcement that Article 50 would be triggered by the end of March 2017. The pound continued to fall with each Birmingham faux pas. Is there a more pervasive public mood of acceptance that the referendum result was bad news for the UK? The “pro-leave” Daily Telegraph’s on-line poll suggested as at 9th October in the mid-afternoon that a majority of participants believed that the UK would be best to remain in the EU (52% as against the three other potential “models” of “outcome”). The perception of a fledgling dawning of reality is enhanced by David Davis whose waffling and evasiveness is as very clear to see as his emerging plan is not. Justine Greening’s appearance on Peston last night was also a big hint. Asked whether the Cabinet could survive she said something like “I think so”. Hardly a show of strength. Whenever the “B” word was mentioned by the said Peston her non-verbal communication said it all. The wheels are not yet off the Brexit wagon but there is some very nasty play of the bearings beginning to make an alarming sound and some of the occupants are starting to take off their ear defenders. The glass was empty. It’s nowhere near half full yet. There may be forces gathering to shore up the fort that social media warriors and pressure groups have struggled to hold against the powers of rhetoric and political ambition. Ably projected to what will hopefully be their peak of influence by 30 years of orchestrated deceit. *since publication sterling has now become the worst performing currency in the world so please accept the writer’s apologies Argentina. Author Marc FolgatePosted on October 10, 2016 October 11, 2016 Leave a comment on What’s that noise? That is what I am doing, according to Mrs May. By challenging the referendum result and seeking to overturn it. I have made it clear that I will never accept the referendum as being a legitimate outcome of a democratic process. That does not make me “undemocratic”. I am a person, I like to think, of principle. In April 2016 it seems that Mrs May believed that it was “clearly in the national interest to remain a member of the European Union”. I believe that she was correct. My position on this has been consistent. More so, it seems, than hers. It causes me anguish to be subjected to the front page of the Daily Mail as I went to get some lunch and to read that Mrs May now accuses me (and my like) of “subverting democracy”. 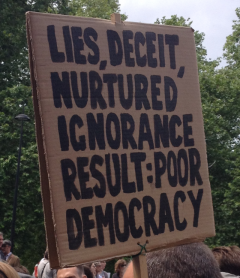 “The first need in a democracy is the supply of unbiased and fairly set-out facts”. There I stood, accused on the front page of the Daily Mail (by Mrs May) of subverting democracy. If that is a way to get us all “on board” then it is about as conciliatory as a slap in the face. A slap conveyed by a spiteful and duplicitous henchman. No such admonition for the likes of Nigel Farage over the advert depicting streams of migrants. No telling-off for Boris Johnson and the occupants of the bus decorated in a £350m “mistake”. No criticism of the right-wing press for their rampant pre and post-referendum irresponsible populism and distortion of the facts about Turkish membership; a myriad of other deceits too. A meeting for Mrs May, it seems, with Rupert Murdoch. Did they have tea? Did she offer him a biscuit? I have been campaigning in my own way for decades about the unconscionable tabloid press in our country and the fact that the European Union faced a Herculean task in defending itself. As Dean says, the tabloid press are motivated by a “demand to create heat rather than light”. 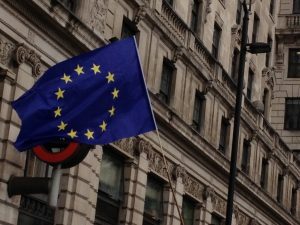 Despite the task, nearly 50% of those who voted in the referendum voted to Remain and young voters appear to have been least likely to have their vision clouded by the bile of the press, looking at the Ipsos MORI poll of referendum voting distribution . There is a correlation between age and newspaper circulation, of course. Mrs May, if you will listen; a democratic process which occurs today may be an undemocratic one tomorrow, the day or even the year after. If one makes the reasonable assumption that the population will shift by natural processes there will come a point at which the outcome fails to express the presently marginally majority view. I suspect Mrs May has met Colin Powell in her time. The same man who said of leadership that it was of “solving problems” and noted that “the day soldiers stop bringing you their problems is the day you have stopped leading them. They have either lost confidence that you can help or concluded that you do not care. Either case”, he concluded, “(was) a failure of leadership”. So, Mrs May, when I seek to democratically protest about a decision which I think is fundamentally wrong and which I believe impacts adversely on my family (including my daughter who is 18 now but was ineligible to vote) how dare you suggest that I am subverting democracy. I look for leadership. A “genuine leader”, said Martin Luther-King, is a “molder of consensus”. Mrs May, if you were not so adored by the Daily Mail and open for tea and biscuits with Mr Murdoch you might have stood a chance of becoming one. At the point at which your trusted henchman takes fire at me from the newspaper shelves in Waitrose the battle must go on and I feel rejuvenated.